J P Reid is an important name in Aberlady's history as it is through this gentleman's writings that we know as much as we do about the village and in particular what it was like in Aberlady at the beginning of the twentieth century. John Pringle Reid ( 1862-1930 )wrote both fiction and factual books as well as poems and he also owned a market garden in the village. One of his publications is The Skipper's Daughters which has the Ship Inn as the central location. 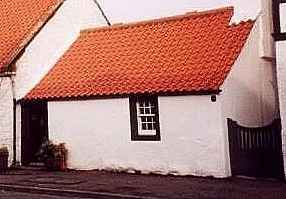 This building can still be seen in the village at the bottom of The Wynd as seen in the picture ( left ). In the original novel he changed a few of the local names, including Aberlady being changed to Glenpeffer. Other changes include Luffness Mains as Muirend, Ballencrieff as Criefton and Gullane as Sandyknowes. Chiel o' the Clachan: An Aberlady Boyhood 1862-1875 is another of his works. This is an autobiagraphical recollection of his childhood in Aberlady. Although not the easiest read due to the local dialect used perseverence rewards the reader with the image of a now forgotten way of life. A Historical Guide to Aberlady is a publication which gives us a good picture of what the village was like at the beginning of the early 20th century. 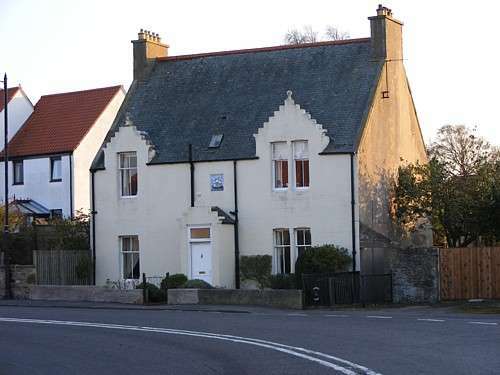 It is written as a journey through Aberlady from West to East, beginning with the sight of our lovely church on entering the village to The Wynd - which J P Reid said was once know locally as 'Quality Street', and buildings such as the Malt Barns and Sherrets at the other end of the village. The latter two of these books have been re-published by Aberlady Conservation & History Society and may still be available from here . If not, East Lothian Local History Centre should be your next port of call.